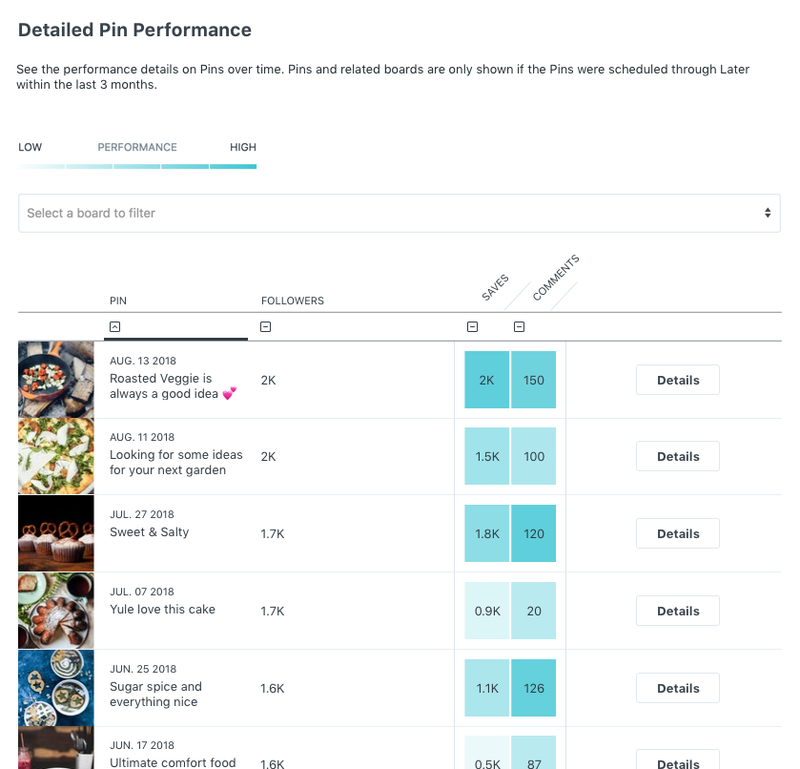 Later’s Pinterest Analytics let you monitor trends in your Pinterest’s overall performance, measure weekly and monthly growth, and discover which of your pins are driving the most engagement. Tracking your follower growth will help you get an idea of which of your Pinterest strategies or posts are performing best for driving saves and comments on your Pinterest profile. 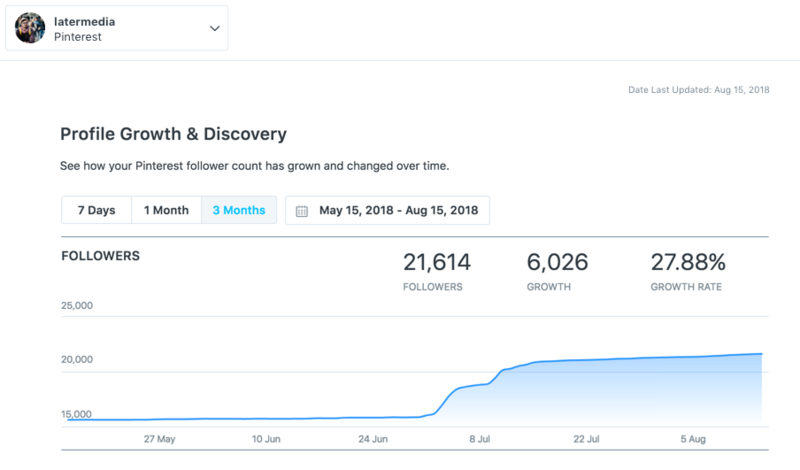 At the top of your Analytics Dashboard choose the date range you wish to view your analytics for -- the follower growth chart will reflect the total number of followers you gained or lost in the time period you have chosen. Note: we start tracking analytics from the day you upgrade and add your Pinterest profile. We cannot display data from before you upgraded (or add your Pinterest profile). To take a deep dive into which of your pins are performing the best, you can look under Detailed Pin Performance. Here you can analyse up to 3 months of pin performance to understand which posts got the most engagement. You can sort your posts by date, saves, number of followers, or comments. This helps you quickly see which pins performed the best. You can also filter the pins in your analytics by boards to see which pins are performing best in each board. For now, Later only tracks your pins for two weeks after they are posted. 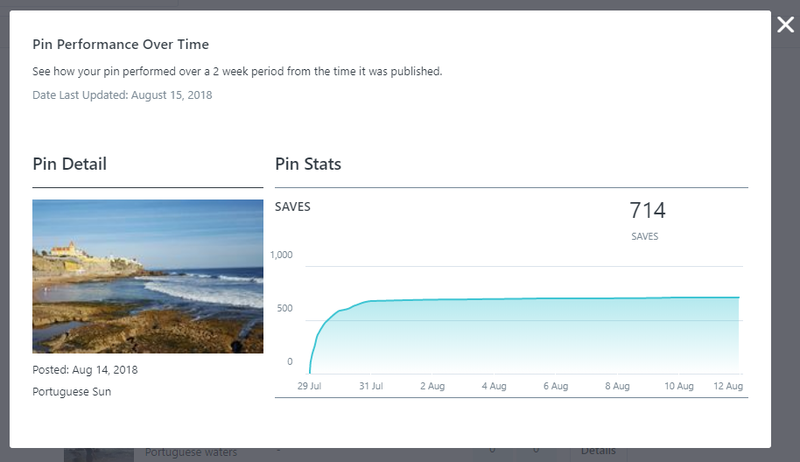 Engagement after two weeks on your pins will not be displayed. Important Note: Later can only pull pin performance for posts that are scheduled through Later.